Researchers have succeeded in converting human skin cells into blood stem cells in an international collaboration project. "This is a first step on the way to generating fully functional blood stem cells in a petri dish which, in the future, could be transplanted into patients with blood diseases," says Filipe Pereira, the researcher from Lund University in Sweden who led the study now published in Cell Reports. Autologous transplantations, using the patient's own blood stem cells, may not always be possible to perform due to previous therapies and the nature of the specific disease. There remains a need for alternative strategies to generate patient-specific transplantable blood stem cells in a test tube. A couple of years ago, researchers managed to convert mouse skin cells into blood stem cells. Now, the same researchers have shown that the approach also functions with human cells. "Skin cells are easily accessible and simple to reproduce in test tubes, which means that they could constitute an unlimited source of cells for transplantation. Blood stem cells, on the other hand, lose important properties when they are cultivated. 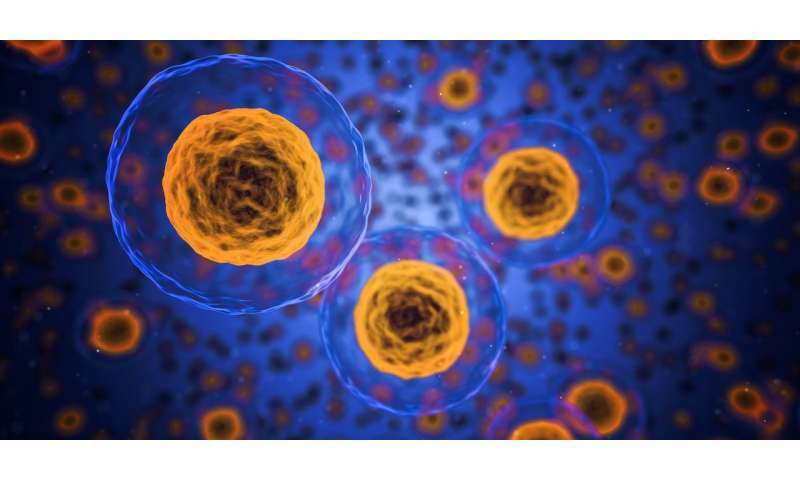 This is why we wanted to investigate whether it was possible to use skin cells as material to produce blood stem cells," says Filipe Pereira, researcher at Lund University and in charge of the international collaboration between Swedish, American, Russian and Portuguese researchers. The process takes between 15 and 25 days and cells undergo a dynamic transition mirroring the birth of blood stem cells during embryonic development. To succeed, the researchers used different transcription factors; proteins that function as a sort of gene regulator and that control the cells' identity. "It is interesting that just three proteins can cause such a major change. The same transcription factors work in both mice and humans, showing that their combined function has been preserved through evolution," says Filipe Pereira. "When we transplanted the new blood stem cells into mice, we observed that the cells survived over three months. The next step will be to improve their capacity to regenerate blood production long-term. We now know much more about the underlying mechanisms of this process which will allow us to make this a reality in the future," says Filipe Pereira. "So far, this is basic research, but it has great potential for development into treatment. Before we get to that stage, we are learning quite a lot about the genetic program of blood stem cells," concludes Filipe Pereira.